A few days ago I visited the Target Gallery in Old Town Alexandria to see the current "Visions from Russia" exhibition, and while there I chatted briefly with the gallery’s new director Mary Cook: welcome to the job Mary! The exhibition itself includes work by Iskander Ulumbekov, Vladimir Zorin, Yuri Bondarenko, and Evgeni Vereschagin. Over the last few years I have been lucky to have been exposed to the work of many gifted Russian and former Soviet Empire artists through Georgetown’s Alla Rogers Gallery, which focuses a lot of their exhibitions upon artists from that part of the world, and it never ceases to amaze me how these diverse lands offer so many gifted artists and refreshing visions. There's no doubt that the rigid approach to teaching employed by former Communist countries, when applied to art produces technically-gifted artists who truly know how to execute and push their medium to whatever limits technical skill can offer. This is a skill often lacking from most American art schools, not all, but most. And so, most of these artists are superbly technically gifted - there's no question about that. Having said that, "Visions from Russia" was slightly disappointing to me, as most of the work was so firmly anchored on a traditional view of the subject matter, that it colored the entire exhibition under a sort of a dated sense of painting (which most of the pieces are, except for a few nice bronzes). And yet there were some standouts in the show. Two pieces from Iskander Ulumbekov are as far away from traditional Russian painting as they can be, and suddenly offer a bridge to a somewhat surreality of contemporary ironic-ism that makes them stand out in my opinion. In both “Morning in the Forest” and “Evening in the Forest,” Ulumbekov has produced two very traditional and somewhat 18th century-looking landscape paintings, even to the dark tonality and hue to the paint. 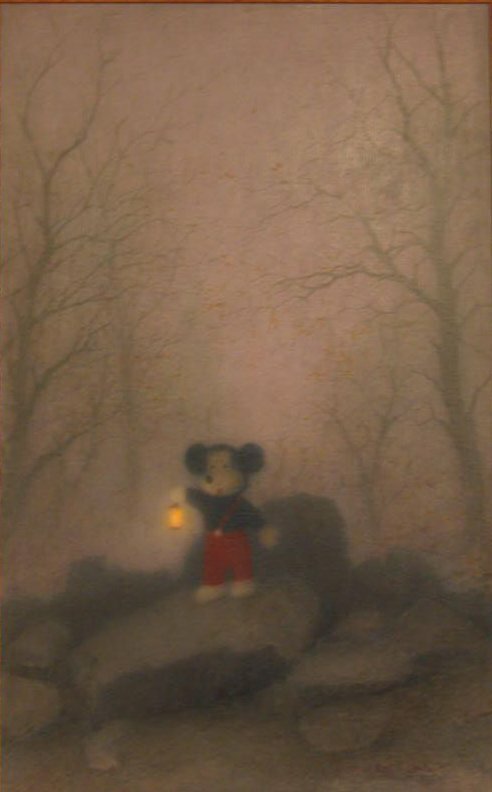 Except that he has introduced two most unusual characters into the middle of these paintings: in one there’s an almost Romantic Mickey Mouse (I almost want to call him Sir Michael Rodent, as he seems almost like an English gentleman strolling through his private forest in a Landseer painting) and in the other a cute (and huge) Teddy bear. It is such a contradiction of visual references, that makes these two pieces stand out from the rest of the works, much like a Ron English painting of the same subject would do in the middle of a Vermeer retrospective. The exhibition runs through August 27, 2006.